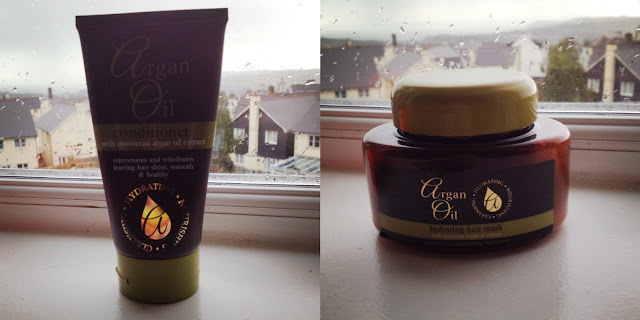 For a while now I have wanted to try out Argan oil because I have heard such good things about it, I had been putting off for a while because it is expensive and I wanted to try it when I could get it cheaper to see how well it worked for me. I was walking around Buyolgy in Par and came across some Argan oil leave in oil for when hair is wet, as soon as I saw the price (£1.79) I had to get some and give it a go. I've been using it over a week now and I've noticed such a difference in the condition of my hair, it's shiny, less fizzy and doesn't looked as damaged as it normally it does. After using the leave in oil I really wanted to try the conditioner so when I saw it for £1 along with Argan oil hair mask I immediately purchased them. First I tried the hair mask which did make my pink hair fade a bit but left it soft and I had beautiful wavy curls. Then the next time I washed my hair I mixed my directions dye with my argan oil conditioner which left it feeling and looking the same as the mask, my only problem is of I use the conditioner and then the leave in oil after washing off the conditioner (the conditioner is quiet thick as is the mask) my hair will get too greasy so now I don't have to use so much leave in oil as I did when I first used it. Once i have put the oil in my damp/wet hair i like to brush it through with my tangle teezer I find it easier then a normal hair brush. I really recommend Argan oil for those who dye/bleach their hair or those who have curly hair like me, it doesn't smell bad either in fact my boyfriend loves the smell of it! I always tell people to get a sample of a product before buying the full size because it may not work for you and you would of wasted money on that product, but those of you in the UK who would like to try Argan oil and don't want to pay out £12+ get down to Asda and try the conditioner and mask for £1 each, i'm not sure where else will do the actual leave in oil cheap like i got mine unless you have a Buyolgy near you.